This Instant Pot Korean Chicken Bulgogi Recipe is my weeknight, and pressure cooker friendly combination of two popular Korean dishes, Bibimbap and Bulgogi. My family loves Korean food! Two dishes that we regularly order at a Korean restaurant are Bibimbap, which is a rice bowl with sautéed vegetables, meat and Gochujang (chili pepper paste), and, Bulgogi, which is basically Korean grilled meat, served with rice or lettuce cups. Instead of the traditional pork bulgogi or beef bulgogi that is on Korean restaurant menus, I prefer making chicken bulgogi. This makes this homemade bulgogi dish a bit healthier. I make the Bulgogi marinade by using Gochujang (Korean chili pepper paste), ginger, garlic, honey, onion and ground or grated pear. The pear tenderizes the meat and provides a subtle sweet flavor, which balances the heat from the Gochujang really well. I pressure cook the meat in my Instant Pot electric pressure cooker. Any pressure cooker will work great for this Korean recipe. Stovetop Method: You can even do this in a skillet on the stove-top. Marinate the meat. Heat a heavy bottom skillet on medium high heat and dump everything in. Cover and cook for 10 minutes, remove lid and cook till chicken is tender and the sauce is thick to your liking. My kids like having white rice with Korean Spicy Chicken, so, I make it in the same pot using the pot-in-pot method. 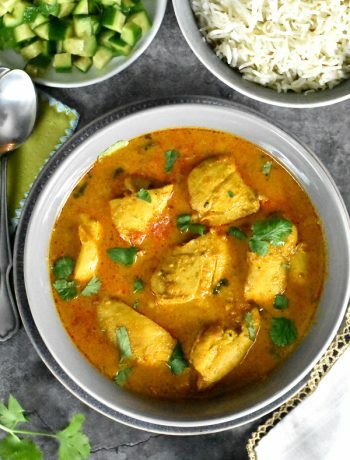 Since white rice and chicken have the same cook time of 6 minutes, it is very easy to turn this into a one-pot meal with just a trivet and an oven safe bowl. Check out the video to see how to make this meal using Pot-in-Pot technique. Here are some PIP recipes. 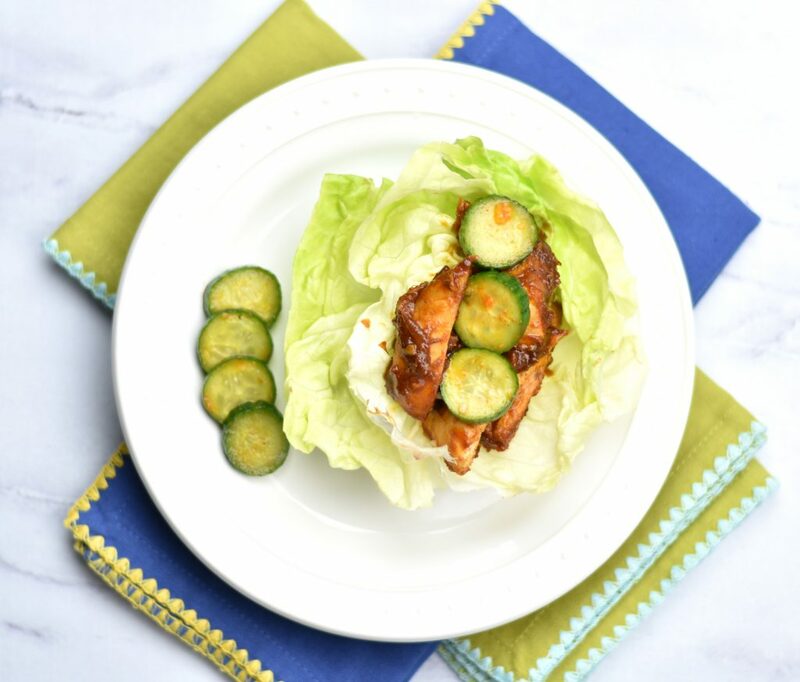 My husband and I like to have this Korean Chicken recipe over lettuce cups. The crisp lettuce contrasts really well with the spicy chicken. I have to tell you, this is one of the tastiest low-carb meals we make at home. The pickled cucumbers really bring the meal together. Keep in mind that Gochujang has sugar in it, so chicken bulgogi is a bit high on carbs. Korean food is almost incomplete without an assortment of side dishes called Banchan. I make a few of them at home, including the Spicy Cucumber Salad called Oi Muchim. 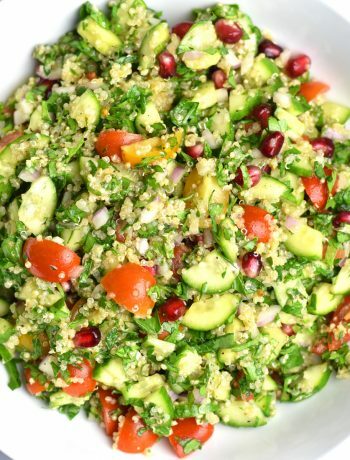 Persian cucumbers or English cucumbers work great for this dish. 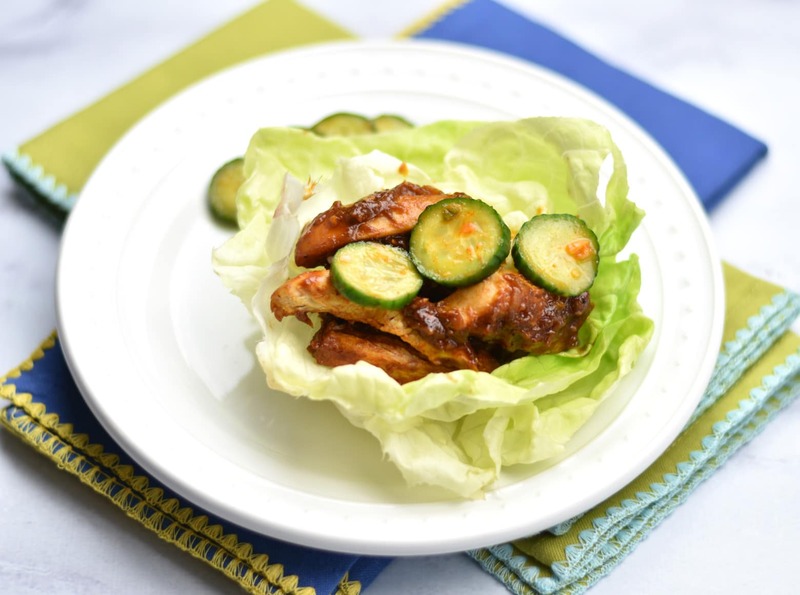 Fresh and crunchy cucumbers, marinated in Gochujang, salt, vinegar and sesame oil, are a perfect condiment for this spicy chicken. 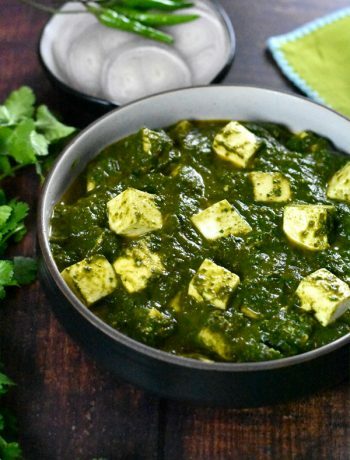 This instant pickle bring this meal together beautifully! To make Oi Muchim, slice the cucumbers thin and keep aside. Combine all the pickling ingredients listed under ‘Spicy Cucumber Salad’ and toss the cucumbers in. Refrigerate for 30 minutes. This time allows all the flavors to blend well. Serve it cold! 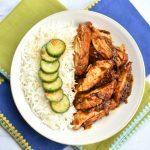 Instant Pot Korean Spicy Chicken Bulgogi is chicken marinated in Gochujang Korean spice paste, ginger, garlic, honey, onion and grated pear. Served with pickled cucumber. In a large mixing bowl, or a gallon size ziplock (easy clean-up), prepare marinade by mixing together everything listed under “marinade”. Add chicken and mix well. Refrigerate chicken for an hour. Heat oil in instant pot on SAUTE mode. Add chicken along with marinade. Add very little water as the chicken and marinade would also release liquid while cooking. If you want to cook rice using pot-in-pot technique, place trivet on top of chicken. In an oven safe bowl, combine rice, water and salt. Place that on top of trivet. Close lid. Hit Cancel and press Manual or Pressure Cook for 6 minutes, vent set to sealing position. Wait for 10 minutes and then manually release pressure by turning the knob to ‘venting’ position. Open lid after pin drops. Remove chicken for slicing. If you want to thicken the sauce a little, turn on SAUTE for 2-3 minutes. Add sliced chicken back in the pot and coat with sauce. 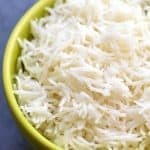 Serve with pickled cucumber over rice, or, lettuce cups for a low-carb option. You can make this bulgogi in a stovetop as well. Follow the steps above to marinate the chicken. Heat a heavy bottom skillet on medium high heat and dump everything in. Cover and cook for 10 minutes, remove lid and cook till chicken is tender and the sauce is thick to your liking. How long do you pickle the cucumbers before serving? I cannot seem to find instructions on that anywhere. Thanks! Hi Deanna, Thanks for pointing that out, I missed that step in the recipe. The cucumbers should be pickled for roughly 30 minutes before serving. I have added the instructions to the recipe card as well. Hope you enjoy this recipe!